Our culture is saturated with instant, easy and shallow. And at this point in time, we mostly know it but usually don't care because everyone else is doing it. We get fat, overspend, fail in our relationships and settle well below mediocrity usually because it's easy and everyone else is doing it. I have high expectations for myself or I feel them thrust upon me. That being said, meeting those high expectations is hard. Really hard. And, frankly, I don't like hard. I like slow-pace ease, thank you very much. My nest is very fully and busy right now two great kids, part-time work and an overworked husband in graduate school. All of it/them are such blessings, but I slip into resentment really fast when its been a long day and I'm not getting a break. Why does everything have to be this hard? Aren't I working hard enough as it is? 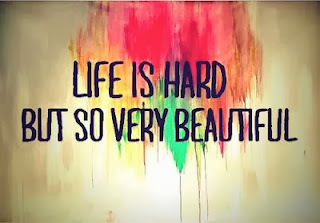 But there are beautiful things to be had in facing the hard stuff. Beautiful things like a healthy body, a balanced budget, healthy marriages and families and going to bed with a satisfied soul.